More about Thunderbird and other Mozilla Program 'profiles' and sharing data on a dual booted machine. 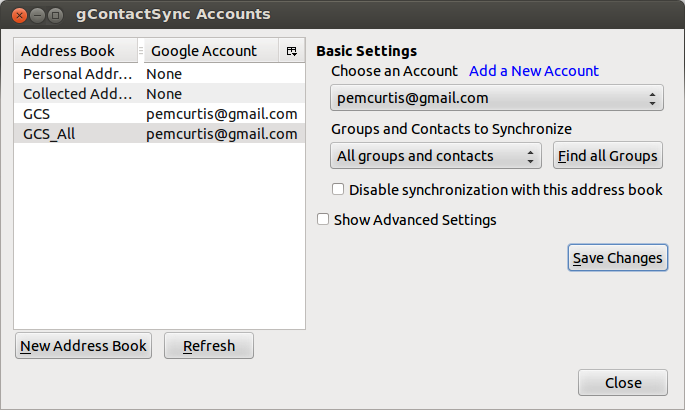 gContactSync for Synchronising Thunderbird Contacts to GMail and hence between many machines and to Blackberries running BIS Sync. Using the Provider for Google Calendars Add-on to Synchronise Thunderbird to a Gmail Calendar and hence between many machines and to Blackberries running BIS Sync. Lookout - noun, a vantage point with good communications commanding a wide view, from which a watch is kept on the surroundings. This page covers the main Ubuntu programs which interact with the outside world and are largely dependent on the Internet, namely Browsers, Email, Contacts, Calendars and Tasks. It is one of a group of specialised pages which have been extracted from and form part of Fun with Ubuntu Linux. Firefox is generally accepted as being the best and safest browser available - it is Open Source and available for Windows, Mac and Linux. There are many 'extensions' available which can be easily loaded to extend its functionality if required. I will mention a few that I use below. Firefox is capable of importing almost anything useful from Internet Explorer including Favourites, Cookies and History so the transition under Windows is very easy. Transfers to Linux is equally easy. Firefox does not need to be installed in Ubuntu as it is the standard browser in all versions of Ubuntu. Hardy Heron and latter have Firefox 3.0 installed and by Lucid and Maverick Firefox 3.6 was standard that is the version I will be considering initially along with the changes in Firefox 5.0 installed with Natty 11.04. There is an extension to Firefox automatically installed which integrates it into the Repository system so some extensions are available from the repositories and, along with the main program, are automatically updated but see below as this extension is somewhat of a poisoned chalice and can cause more problems than it solves. I usually do a little configuration to make it easier to use when I install it for friends or on my clients machines. I set a home page by Edit -> Preferences -> Main Tab (also decide if you want it to open with the pages you were viewing last) and then on Advanced tab tick for Firefox to check if it the default browser. Have a scan through all the other options whilst you are there. If you use Google a lot then you should add a Googlebar Extension as you can under Windows and add a 'toggle googlbar icon' alongside the others added earlier. Firefox, like all the Mozilla programs has a built in facility to run small programs called 'extensions' to customise and add extra facilities and functionality. There are now hundreds, if not thousands, of extensions available which are added by an internal mechanism and most work under Windows, Linux and Mac operating systems. As well as those you add yourself you may find that other programs such as Windows Virus checkers (AVG is an example) add them to enhance there own facilities - these may not be compatible between operating systems. The reason I mention this will become apparent soon. I have found some of the following to be essential or useful to the way I work. Extensions in Firefox and other are usually added by: Tools -> Add-ons -> Get Add-ons -> Browse all Add-ons which takes you to a web page where you can search for an add-on that does what you require and download it as an .xpi file to your desktop. I have been using Googlebar for a long time and still prefer it to the official Google Toolbar - one or other is an essential addition if you do a lot of searching. Googlebar adds an icon to the main toolbar customisation so you can hide and display it when you need to have a larger viewing area. There are still web sites that check the browser and refuse to display pages in browsers other than Internet Explorer. This add-on enables Firefox to 'pretend' to be IE, Netscape or Opera and allow most pages to display. Not available from the Firefox extensions site due to problems with advertisers as it enable adverts to be bypassed. Still available from http://chris.orr.me.uk/caughtup/. I do not use it but I found and tried it out for a friend who is very impressed with it. Natty uses the latest Firefox 5 and this is now available from the mozilla teams firefox-stable PPA. Note you should not use Ubuntuzilla PPA with Natty as the versions there do not integrate with the Unity Desktop or AppArmor and you should remove the repository before upgrading. This version is significantly improved but you may need to reconfigure your toolbars as items such as the + for a new tab may have gone. It is easiest to reset the toolbars to the default then start again when you have seen the changes. I have also moved the tabs back to their usual place. You may find that some of the Extensions need to be updated and some may not yet be compatible. Firefox cannot use the profile "??????" because it is in use. To continue, close the running instance of Firefox or choose a different profile. This message is apparently given if the profile is locked or if the profile can not be found. It is clearly not a stale lock file as it also occured when I created a new profile so it would seem Firefox cannot find or has access blocked to the Profile. I have edited profiles.ini to see if it is related to the IsRelative addressing and that is not the cause as one can change a relative to absolute location without problems. I was baffled so I sought advice on AskUbuntu which is a very useful resource. There were some useful initial suggestions of what to try including the new stand alone Profile Manager and to use a Symlink from the default folder to where I have my profiles. I tried a symlink from .mozilla/firefox to my normal folders on my DATA drive and again I can not access the profile in the folder to which the link has been set although I can use firefox -P to set up an entry in profile.ini which looks correct. I also tried a symlink to a folder under ~/.mozilla/firefox and that worked perfectly. This was now looking like a very serious problem as the common use of a profile on a USB stick is ruled out completely if the symlink approach does not work. My next approach was to try it on clean install which never had firefox-mozilla-build installed - I had to use a LiveCD as I only have one machine currently available to experiment with. Again I could not access the profiles. The breakthrough came with a suggestion on AskUbuntu that I checked the AppArmor-Profile for Firefox. AppArmor ("Application Armor") is a security module for the Linux kernel designed to proactively protect the operating system and applications from external or internal threats, by enforcing good behavior and preventing application flaws, even unknown ones, from being exploited. AppArmor security policies completely define what system resources individual applications can access, and with what privileges. AppArmor works by implementing security profiles (apparmor-profiles) that restricts the capabilities of protected programs. 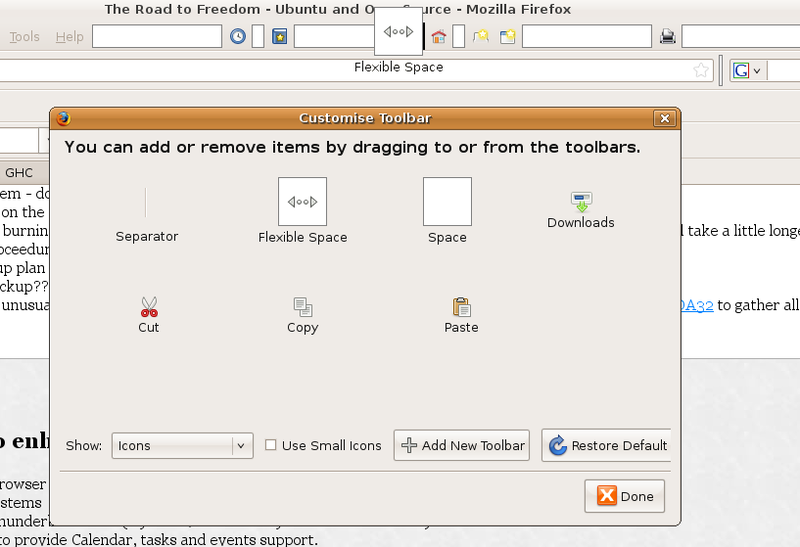 Ubuntu has included AppArmor since 7.10 but up till now the apparmor-profile for firefox has present but not enabled. This has restored the behavior to what I expected and firefox now works with profiles in any location. The suggestions I got from AskUbuntu especially from lovelinux were of great assistance. The following AppArmor profile is my effort to try to enable access to removable drives and other mounted under /media. It follows an earlier version of the apparmor profile for the changes which I found in a fascinating and flaming thread ( https://bugs.launchpad.net/ubuntu/+source/firefox/+bug/592121 ) where these lines had been criticised for allowing too much latitude! I have tighten up everything much more and it is much better than just disabling the firefox apparmor profile totally. I have left wider options available in my listing below but commented them out. I have ultimately restricted full access to just folders under a folder called Profiles on any drive mounted in /media which covers extra my extra DATA drive, USB sticks and encrypted volumes. I have retricted other folders to read access only. My only uncertainty is whether this will need to be repeated every time firefox is updated. # /usr/share/.../extensions/... is already covered by '/usr/** r', above. # Site-specific additions and overrides. See local/README for details. 12 profiles are in enforce mode. 0 profiles are in complain mode. 1 processes have profiles defined. 0 processes are in complain mode. 0 processes are unconfined but have a profile defined. Setting /etc/apparmor.d/usr.bin.firefox to complain mode. 14 profiles are in enforce mode. 1 profiles are in complain mode. I am mostly running in complain mode and occasionally inspecting the log file for errors. Setting /etc/apparmor.d/usr.bin.firefox to enforce mode. 15 profiles are in enforce mode. 2 processes have profiles defined. The final step in this long saga was when I discovered that the #include lines in the apparmor profile are not includes which were commented out but the actual include statements. I could therefore use the facility to put any modifications into the file /etc/apparmor.d/local/usr.bin.firefox - this means that changes are not made in a system file which could be changed during an upgrade of firefox. # Site-specific additions and overrides for usr.bin.firefox. # For more details, please see /etc/apparmor.d/local/README. # in folder Profiles and to have read access to everything. Email is an important part of use of the internet, arguably second only to browsing. It is also an area where many people want to maintain information, not only in the Address Books and Contacts Lists on which people increasingly depend, but also in an audit trail of the email communications sent and received. The problem is that this information is not in a simple form like a list of documents that can be opened, it is all mixed up with various settings for the programs or in files and databases which are almost total opaque and incompatible between email programs such as Outlook Express, Outlook, Thunderbird and Evolution. As you would expect there are no provisions in Microsoft programs to import from non Microshaft alternatives. Mozilla Thunderbird however is much better and does a first class job of importing mail, contacts and accounts from Outlook and Outlook Express. Likewise Mozilla Firefox imports favourites, history and cookies from Internet Explorer. The Mozilla programs have almost identical 'stores' for their information called profiles largely independent of the operating system in use so a transfer from Windows to Linux and vice versa is quite easy. In fact, under some conditions, it is possible to have a single profile accessible from both systems so you can move backwards and forwards. I understand that the latest versions of Evolution will also be capable of importing Microsoft Outlook .pst files which contain all the email, contact, calendar and task information. Before getting to details of choosing our email program and the specifics of transferring information etc it is worth looking at how the main email systems work and how that can also help us in our transition, maintaining an audit trail and keeping various machines synchronised. POP Mail: Most people understand how POP (Post Office Protocol) mail works, the incoming mail is delivered and held on a server at your Internet Service Provider (ISP) and, in the simplest case, you download it to your machine on demand (usually called a Send/Receive activity in your email package) and it is deleted from the server. This was fine when the typical user had only one machine in one place. Nowadays many people access email from home, their office, from a mobile and perhaps a PDA and Phone. This leaves ones incoming mail fragmented in many places. Most email packages and POP mailboxes therefore allow you to collect your email whilst leaving a copy on the server and many also allow one to just download the headers or a restricted amount of data in each email. This is a much better way of working as the downloads can be done on many machines and the eventual deletion from the server is done on one machine and only after it has been satisfactorily archived. It does not help with outgoing mail which has to be copied to another account or some other method to allow an audit trail. IMAP: There is an alternative to POP mail called IMAP which stands for Internet Message Access Protocol. In this case the email is stored on the server and never downloaded automatically. One can create addition folders on the server so one can have a complete filing system on the server and available whilst one is online, on corporate systems there may even be shared folders accessible by many users. Email stored on an IMAP server can be accessed and manipulated from a desktop computer at home, a workstation at the office, and a notebook computer while traveling as well as ones phone/PDA, without the need to transfer messages or files back and forth between these computers. In the simplest case data is only transferred as required - when you select your inbox or a remote folder the headers are transfer - when you select an email the message body is transferred and only when you open an attachment is the attachment transferred You can of course copy anything to a local folder on your machine to work on it and when you finally send a reply (whilst online) it is saved on the server and accessible from any other machine. IMAP is at its best when you are on a Broadband always on internet connection - a GPRS/3G connection charged on data transfers is acceptable. Implementation by ISPs: Many Internet Service Providers (ISPs) offer the choice of a mixture of POP or IMAP mailboxes - in some cases they are common boxes and the access protocols and port number used differentiates their use. Most POP and IMAP mailboxes are also accessible via a Webmail interface when you are in an internet cafe or on a friends machine. Even if you do not want to change completely without extensive trials it is worth setting up a single IMAP mailbox so when you are traveling so you can transfer mail from your 'mobile' machines via an IMAP mailbox to you home machines filing system via the IMAP mailbox without worries about the incompatible local mailbox and folder formats. You can also tidy up whilst traveling whenever you get a fast WiFi data link in an internet cafe. I do not feel comfortable solely depending on a remote server to store my emails long term but for a few months between archives it seems a very sensible way to proceed. With a GPRS/3G connection where one pays for data transfers rather than time online, it seems a very economical way to operate and most email packages allow one to download selected local copies for offline working as well as remote copies. Some cautions: Both POP and IMAP protocols are define by RFCs but the implementation by email packages may not be rigorous when it comes to some of the more advanced features. It is possible that POP implementations of features used for leaving emails on the server for a fixed time differ between email packages and may be implemented locally or on the server so if you have different settings or ways those features are implemented between packages you may have a problem. A good way to start investigation is to see if the same mailbox can be accessed by POP, IMAP and Webmail without problems. Firstly note that I have not even mentioned Outlook Express (now called Microsoft Mail) as the only thing in its favour is that it is free, familiar and built into all versions of Windows. For use at home with unlimited bandwidth and money to throw at virus and malware checkers and hiding behind hardware and software firewalls Outlook 2003 still has the high ground in my estimation. Outlook 2003 also allows synchronisation with my O2 XDA Exec and Pauline's Palm providing the backup of contacts, appointments, tasks etc. The comparison for mobile use is less clear both under Windows where the choice is Outlook 2003 versus Thunderbird and on Linux where it is Evolution versus Thunderbird (or possibly Outlook 2003 running under Crossover Office). In the first case it all depends how much you use the functionality over and above email and address books and if you need to sync/backup a Windows Mobile Pocket PC. Thunderbird is faster and more secure in what it does but it does less - on email both offer downloading of headers or limiting size and both have good spam checks although the Outlook 2003 checker does need regular internet updates. Outlook has always had a superb archiving system and I have an audit trail back to 1996 and it is also easy to back up the single .pst file with everything in it. I still keep one dual booted system at home with Windows XP so I can use Outlook 2003 to provide a backup for the XDA contacts. I put a particular emphasis on mobile operation when comparing the options under Linux as we spend a lot of time away from home and without access to Broadband with cost and speed implications. Evolution which is installed in Ubuntu as the default email package offers the most basic functionality in calendars, appointments, but seems very outdated - it is comparable to the earlier versions of Outlook patched to offer some modern functionality. In contrast Thunderbird has very much the same feel as Firefox, allows one much more control over how one downloads mail and various extensions (lightning for Calendars and Tasks and MoreFunctionsForAddressBook to strengthen contact management) add most, if not all, of the functionality found in Evolution and Outlook. The latest version 3.x has a tabbed presentation of email etc. Whilst on the move I either download headers only or limit the download to the first few Kbytes - this is easy in Thunderbird and can be set independently for each account by Edit -> Account Settings -> Server Settings and Disk Space for each account. Downloading seems extremely fast compared to Outlook or Evolution. You have no such choice currently over headers or the ability to set download limits in Evolution. Spam checking is very poor in Evolution and slows the downloading to a crawl, several seconds per email because the spam checking needs to do internet checking to be in the least effective. In contrast Thunderbird has been quickly trained and after a few hundred mails seems to work very well. I have been deliberately accessing a few old and spam ridden accounts for training and the last download identified 48 spams, missed 2 and had one real email identified as spam. That was better than Outlook 2003 did with monthly updates of its data base! For periods of a few months away I leave all copies of all the mail on the server and then collect into the master system. Thunderbird also gives the ability to blind carbon copy all outgoing emails to a separate email box which ensures I can also pick up all outgoing emails on the home system. I have therefore chosen Thunderbird, with two extensions installed, over Evolution as my standard email package. Make sure you know all the email account passwords and preferably the other details such as login names - the accounts should transfer but for security reasons you will have to enter your password for each one. Download Thunderbird by going to Thunderbird - Reclaim your inbox and clicking on the big green button and save it to the desktop when requested. Double click to install and follow the wizard. Do not run it at this point. Collect your email on your existing email package Outlook or Outlook Express (Mail under Vista). Try to avoid downloading email at this point if it gives you an option - you could disconnect from the internet before running the first time to make sure of this. The reason is that Thunderbird is usually set by default to download emails when you start and you want to set up the accounts to leave a copy on the server until you make the transition for good. Now we need to set up various options to match our way planned way of operation and for filtering junk email - this is appropriate to Thunderbird under Windows or Linux and you might as well do it all under Windows as these settings will be transferred to Linux as they are all stored in the Thunderbird 'profile' mentioned above. Check for new messages at startup - un-ticked whilst we are setting up then your choice. Check for new messages every.... - un-ticked whilst we are setting up then your choice. Move junk emails to junk folder on local folders. That all the options set up although you will see there are many more which can be useful to the way you chose to work especially if you are mobile and want to restrict the amount of downloads. The profile manager is simple and self explanatory so the creation of a new profile using your profile from another machine is very simple and powerful and is also useful for restoring a backup. You can chose the profile to use in the future or chose to automatically open the profile manager every time you start Thunderbird from then on. 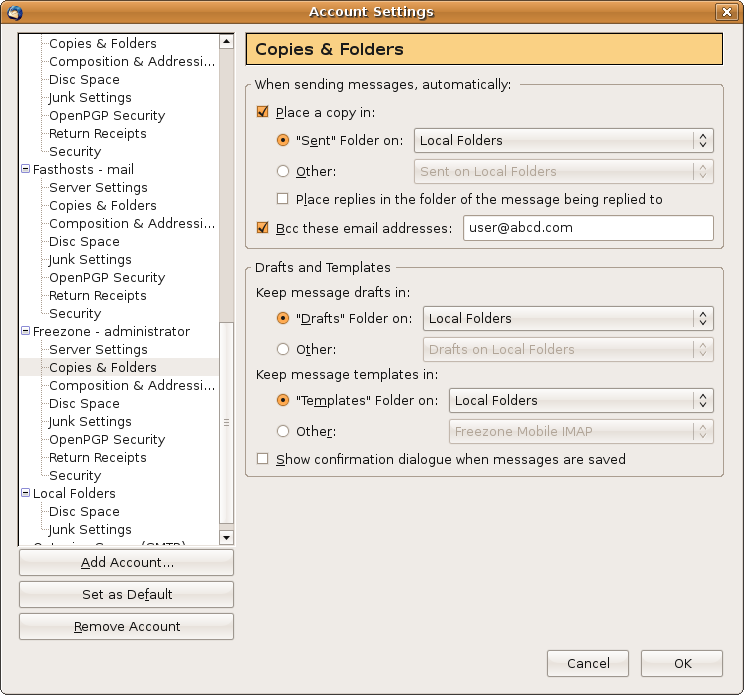 Thunderbird Version 3 has a number of extra entries in the profile folder which are automatically generated when an earlier profile type is opened. There are reports that it is still backward compatible but I have not tried and would advise caution in mixing like that. Thunderbird Extensions are also stored in the profile folder and many extensions are not compatible between operating systems and between TB2, TB3 and TB5 so uninstalling all extensions before moving a profile is prudent although checks and warnings are usually provided and i rarely bother these days - I do tend to backup the profile fairly often. Under Extensions Click “Install” button and look for the Extension Module (.xpi file) you just downloaded. Under Thunderbird 5 this is just a small button with drop downs. The data and configuration information is usually stored in the profile folder. I found a really useful extension for Thunderbird which enables one to see and use several of the hidden fields which are not yet implemented and I have installed it on all my machines. It is called MoreFunctionsForAddressBook and is now on version 0.6.8.1 which covers <TB18. It seems almost too good to be true. It adds in many of the functions which are missing in the Thunderbird address book as well as allowing display and use of some hidden fields such as Categories and Birthdays. You can also select and copy addresses and notes from the 'preview' and do searches which include extra fields such as categories and notes. It also extends the actions to handle exporting, sending and importing Vcards. I have done an extensive search looking for the catch but have not found any problems on the internet so far, if you search for problems you just get examples of the problems it solves! I still think that Outlook 2003 is the best overall email, contact management and calendaring package against which the opposition must be judged but Thunderbird with the Lightning and MoreFunctionsForAddressBook Extensions is now coming very very close even before you take into account the costs, security and other Microsoft issues. Under Extensions Click “Install” button and look for the Extension Module (.xpi file) you just downloaded. I was so impressed with MFFAB that I have tried and install as standard a number of other extensions. Lightening Adds Calendar and Task functionality. SyncKolab Synchronises my Personal Address Book, local Calendar and Tasks between all my machines running Thunderbird via an IMAP server. Should not have interactions with the other address books as configured as it set only synchronise my Personal Address Book. Provider for Google Calendar integrates Google calendars into Lightning alongside other local and web calendars and provides bidirectional access whilst online. Should not interact with gContactSync as configured which does not synchronise Calendars at present. gContactSync is used to add synchronisation of my Blackberry via Google Sync and Google Calendar to a separate Address book ie no multiple synchronisation with SyncKolab with risks of multiple entries. Sync Kolab: See below for more information under Synchronisation. Mozilla Sunbird is a cross-platform calendar application. It provides a full-featured and easy to use calendar application that can use a variety of standard internet calendar servers (eg WebDav and CalDav) and file formats such as iCal in parallel with its internal database. Lightning integrates the Sunbird calendar with Thunderbird. Lightning is implemented as an extension making it much more tightly integrated with Thunderbird than the standalone Sunbird thus allowing you to easily perform email-related calendaring tasks. Lightning is by far the most important Extension to Thunderbird and changes it from a good email package to a full function schedule management application on par with Microsoft Outlook and Evolution in functionality. When this page was written it looked likely that future development would concentrate on Lightning as most of the use of Calendars and Tasks requires the use of email. There are two ways to install Lightning in Ubuntu. The first is using Applications -> Add/Remove and search for Lightning which adds the latest version in the Ubuntu Repository system. The best way is to use the mechanisms built into Thunderbird. I believe the built in mechanism is best as this ensures you can chose the [latest] version especially if you intend to implement and of the sharing and synchronisation activities which will be covered later. It is possible to set up Thunderbird to tell you when updates are available or to automatically install them. It is best if it Lightening is the first extension installed. Under Extensions Click “Install” button and look for the Lightning Calendar Module (.xpi file) you just downloaded. The button is smaller under version 5. All the configuration and data for Mozilla programs are held in what is called a 'profile' and the 'profile' folders for all the main Mozilla programs look very similar. The profiles have what is called a salted name – that means it is randomly generated and 8 characters long so it is difficult for a hacker to identify. However the first default profile is in standard place and has an extension of .default and new profiles are reached by pointers in an .ini file one level up in a folder often called profiles. The easy way to find your profiles is to do a search for files with a *.default search. Ubuntu Hardy has a file search under Places. I have set up all my Dual Boot machines to have at least one common Drive/Partition which can accessed from Windows or Ubuntu. I have made this a FAT32 partition because there were some concerns over the reliability of writing from Ubuntu to the proprietary format NTFS which Microsoft has developed. This has been overcome I understand and Hardy Heron and higher should be OK with an NTFS common drive.This FAT32 common partition has to be created before starting to install Ubuntu or created at the same time in an unused part of the drive using the Linux partitioning tools – do not try to modify a Windows Partition especially one used by Vista from outside of Windows. Vista allows one to shrink its partition to make unallocated space. Under XP I use an old copy of Partition Magic 8 to create and resize partitions. This all opens up some very interesting opportunities as I recently realised. If one is running Thunderbird and Firefox under both Ubuntu and Windows then it should be possible to put their internal and configuration data (which is all in the 'Profile' folder) on the common drive and access emails, address books, calendars, browser favourites, cookies and history etc from both machines. This seemed a big step forwards and I used the technique of a common profile on a permanently mounted drive formatted as FAT32 so it was accessible both from Windows and Ubuntu for a period when I was still using Windows on a regular basis. Hibernation works by writing the contents of memory to the disk and then retrieving it again when you turn back on. If you have been working on the same data or even access the same directories then the 'hibernated' data can and usually will overwrite it. It is possible to hibernate provided you go back to the same system but I have forgotten too many times so I turn off hibernation on both systems. In Windows: Start -> Control Panel -> Power Saving. I have covered it for for Ubuntu under Disabling Suspend and Hibernate in Ubuntu . The only problem, other than hibernation, I have found in sharing the profiles for Firefox is with Extensions. In Windows AVG forces in a couple of extensions which are not available under Linux and there is an extension for Ubuntu when running in Linux which is clearly not available in Windows. I find that when I swap I get a popup saying extensions are being installed when I swap from one system to the other - this is to be expected but it would be nice if the messages could be suppressed. In general Extensions are likely to be a problem unless they are available and compatible in both Windows and Ubuntu. The Ubuntu Firefox Extension is added by Ubuntu to allow certain extensions and updates to be handled by the Ubuntu Repositories but in many cases it seems to inhibit correct operation of extension you add yourself in Firefox and many people inhibit it as a matter of course within Firefox. Thunderbirds version 3 and 5 has a number of additional files in the profile folder and should only be dual booted with the same version. Kolab is a Open Source Groupware Solution for Emails, Appointments, Contacts and more. It supports mixed client environments because of an open storage format. Kolab was created for the needs of the German Federal Office for Information Security (BSI) by contract in 2002-2004 and is used there in a heterogeneous environment. Kolab won the Linux New Media Award: Category 'Best Groupware Server' in November 2005. In other words it is a professional set-up. We are interested in only a very small part, namely SyncKolab which is the client which runs as an extension in Thunderbird. This can also be run using any standard IMAP mailbox to synchronise Thunderbird Addresses, Calendar Items and Tasks. Each item is converted into a standard Vcard or iCal format and stored on the IMAP server as though they were an email. When you synchronise only the headers need to be downloaded for checking for changes whilst the local copies are checked fully. Any changes are then 'mailed' to the server or the local copy updated. There is no limit to the number of clients that can be synchronised. SyncKolab is extremely useful but has given me considerable grief and only recently has it been working to my satisfaction in its synchronisation of Tasks and even Address books have caused problems on occasions. Data usage during a synchronisation: I was worried that there would be a significant cost in data but it seems to be small enough to be OK for mobile use. My address book has 850 entries and there are a small number of calendar entries - the total data flow the first time after connection when the complete set of headers has to be downloaded is about 50 kbytes and subsequent synchronisations reduce this to 10 kbytes, to this has to be added any cards which need to be updated but unless you have a lot of notes that will be under 1 kbytes for each. You might not want to do it every day whilst abroad but it is fine on a mobile in the UK. Compatibility of Lightning versions: You need to have a compatible version of the Lightning extension installed which may be a problem if you have loaded a modified version for Ubuntu using the Package Manager - I have had to uninstall the package manager versions and use Thunderbirds internal mechanisms for extensions. The SyncKolab extension is very small and very easy to set up once you have made some folders on the IMAP mailbox. The configuration tool (Tools -> SyncKolab Options) takes you through a very obvious wizard and ends up in is a single screen with every possible parameter identified on your system and available to select via drop down boxes (IMAP mailbox, folders on the selected mailbox, address book and calendar). It can take a few minutes with an address book of 900 items like I have to download and check all the headers but that is a small price to have everything synchronised. I have customised the toolbar to have a Synchronisation Icon. Edit your prefs.js and remove all lines containing "SyncKolab" - they will be at the top. Rebuilding IMAP Mailboxes: Another cause of problems is within Thunderbird as it is possible for the indexing files for mailboxes to become slightly out of kilter and Sync Kolab is very sensive to this. If you find that items do not get deleted then it is worth rebuilding the files in thunderbird. In particular I have found that problems with tasks failing to be deleted correctly in the past have been cured by rebuilding the indexes for the IMAP mailbox used for the Tasks - Right Click on the folder -> Properties -> General Information tab and click on Repair Folder. Options changes cause Downloads: I have found that any opening of SyncKolab Options sometimes forces a download of everything from the server so make sure you always Synchronise before changing any options to avoid recent local changes being overwriten - if you are just inspecting click cancel at the end. The new version gets round a number of old problems with the status line displays and has a better display window and improved checking and handling conflicts but I found that I was suffering a number of strange hang ups and errors displayed in the error console. Many of these problems seem to be the result of the improved error checking which is showing up anomolies in some of my older data. 1. I made sure that the version on the server was up to date and backed up my profiles on all machines I was using. 2. I forced a complete local update (by changing the Options which forces a local update) - this got round the initial hang up and errors in the console and allowed the Synchronisation of my contacts to proceed. Two contacts had repeated conflicts whatever I did and finally had to be replaced. 3. I created a new local calendar which again forced a complete download when I changed the Synckolab Options to use it. A number of calendar items (6) had to be deleted on the server because they locked the system - three were complex repeated items and a couple contained strange code on inspecting the attaached .xml file. One I never found a cause but just got deleted. They were all old items so their loss was of no consequence. 4. None of the Tasks without a start date would synchronise until I created a start date. NOTE: Any finish dates I set were deleted after a couple of synchronisations which may be a bug. It is now a considerable improvement on earlier versions - I must give many thanks to you for all the hard work put in by Nico Berger. 'Round Trip' test on Events and Tasks in the last issues of version 2 (nightlies) which are very favourable. By 'Round Trip' I mean that I create or edit, say, a simple event on machine 1, Synchronise twice to make sure that there are no problems of alternating changes. Synchronise on machine 2, again twice for luck, make a minor change in the comment field to force the change to be propagated back to the first machine and check that everything is what one expects. I have done that test progressively adding and changing each major field in turn for both Events (Calendar Items) and Tasks with no significant problems observed. I have an anomaly in the task status but there is also a problem with how Lightening reconciles Task Status and Progress (which ends up with it greying out some fields) so it is not clear if what I am seeing is a bug in Lightening or in how Task status is handled in SyncKolab. If I get to the bottom of it I will file a bug in one or other or both. The tests above only confirmed that the fields are correctly transfered between machines. I have not checked that a change every one of the more obscure fields is detected. I advise any user who is dependent on a field to check themselves or make a habit of making a small change in the Notes: field - I try to add the date of each update to that field which also makes certain the change is identified. Date of the last Update. This is now coming into use in November 2012 but changes do not seem very significant over nightlies I have been using. Calendars however seem to have problems on the nightly I am using (3.0.1 of 21-11-2012) with TB17.02 and I have had to disable calendar synchronisation at present to enable the important address book synchronisation to continue. 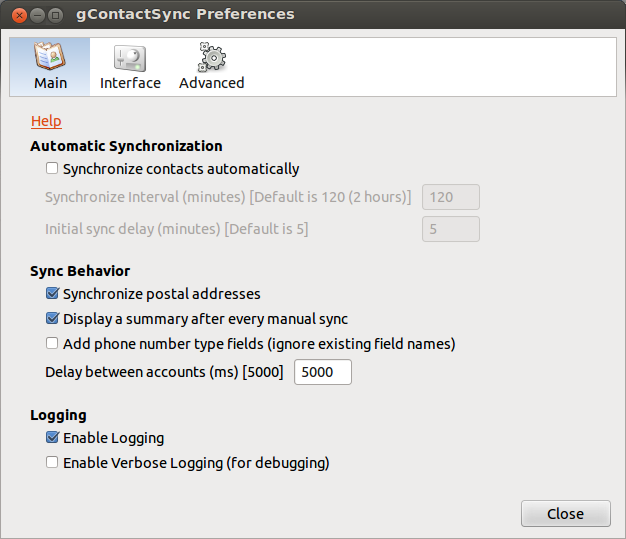 gContactSync for use in Synchronising Thunderbird Contacts to Gmail and hence between many Machines and to a Blackberry. 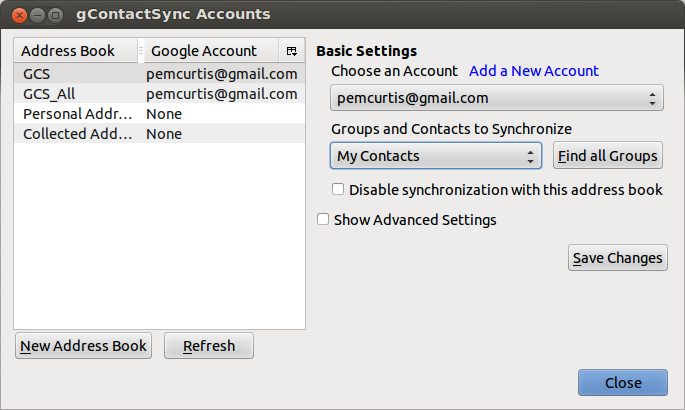 gContactSync is an add-on (extension) that synchronizes contacts between Google (Gmail) and Thunderbird, and also supports importing contacts from Facebook, Twitter, and more. You can synchronize multiple accounts with multiple address books, and it fully supports regular and hosted Google Accounts. By default, it synchronizes the first four e-mail addresses, the first screen name and number of each type in Google and every attribute in Thunderbird (not all of these are visible in Gmail, however). It adds several new fields to Thunderbird for e-mail addresses, screen names, and numbers. Anything that is not synchronized should ideally be preserved but there are a couple of important exceptions where data can be lost in Thunderbird following a reset which results in a reload from the server. There are currently (December 2012) two versions 0.3.5 which is more stable but lacks the facilities to do what I require and the beta version of 0.4 (0.4.0b2 in Dec 2012) that I am using. gContactSync can be set up to synchronise multiple Gmail Groups and in that mode expects the default groups of My Contacts, Friends, Coworkers and Families as was the case with Gmail Contacts until very recently when the defaults were changed to the single My Contacts group. See http://support.google.com/mail/bin/answer.py?hl=en&answer=97952 for further details of the changes and situation with existing contacts in those groups. Thunderbird does not implement Groups - there is a hidden field called Categories but that is not used by gContactSync and instead there has been a slightly uneasy shotgun marriage between Google Groups and Thunderbird Mailing Lists. I say uneasy because there are considerable differences between their Raison d'être - Thunderbird's Lists are a rather basic mechanism to add lists of contacts to emails and therefore expect an email address to be present whilst Google's Groups are much more flexible. Furthermore there are some long standing and intermittent open bugs in the Thunderbird Address Lists, in particular with respect to drag and drop. See https://bugzilla.mozilla.org/show_bug.cgi?id=282841#c8 as an example of problems going back over 6 years. When I started to use gContactSync I took a lot of precautions in backing up as when such synchronisation programs go wrong they can destroy lots of contacts or make multiple duplicates - I am not sure which is worse so better to play safe! The first stage was to back up my Thunderbird profiles (by the simple method of a drag and drop copy into the same folder). I fired up my only remaining Windows machine which has the Blackberry Desktop software, plugged in the Blackberry and ran the desktop software. When it started it automatically started a synchronisation with the Outlook Desktop Software Contacts and Calendar giving me a Blackberry backup. I also requested a manual Backup of the entire Blackberry (belt and braces). I also checked that nothing had changed by a sync of the Blackberry to existing Google Contacts list and calendar and then made a change in a calendar item and an address book item (paranoia). Do a Google Search and you find all sorts of information and links at the top which include a sign in at top right or search for gmail signup which will get you right there. It is difficult to get a meaningful name so think about what other can remember such as your initials and the last figures of your telephone number or house number. I installed version 0.3.5 in the initial stages and almost imediately switched to the latest development (beta) version - go to gContactSync , scroll to the bottom of the page and expand Developer Channel where you will find the link to install the latest development version. Once you have downloaded a development version it will automatically update to the latest development version. It is important to do the initial Synchronisation correctly. Either the address book on the PC or in gmail preferably needs to be empty to avoid any duplicates and I found that by far the best way and the easiest way to just create a new empty address book in Thunderbird (Open the Address Book -> File -> New -> Address Book) or even easier create it within gContactSync and then synchronise to a Gmail account with an existing Contacts list. You can then copy your existing contacts across to the new Address Book in sections and synchronise to get them into gmail if they are not already there. There are various choices on the setup screen for an Account in the Groups and Contacts to Synchronise dropdown and one needs an appropriate choice. During all my early tests and for many months I thought that the All Groups and Contacts was the best option but I am currently experimenting with more success using just the My Contacts option. This has the advantage of automatically adding every item in the Thunderbird address book to the Google Contacts 'My Contacts' Group without having to create/use a flaky Thunderbird Mailing list. Your choice will have to depend on whether you already use Google Groups, use Thunderbird Mailing Lists and/or are synchronising a PDA/Smart Phone. I had so many troubles with Thunderbird and Lists in the past that I have never added them to my Personal Address Book (PAB) and have just used them when absolutely essential in copies of my PAB so my choice is more obvious as I do not need to ever synchronise them. I however intend to look again into the behaviour of Thunderbird Lists in more detail and will initially write up what I find in a Diary page. One is prudent to run some initial tests when you start to use an new synchronisation program and not to risk your master address list (Personal Address Book) or arguably ever - run gContactSync on Personal Address Book (PAB). There are a few extra steps I went through to ensure that all the fields are correctly synchronised as gContactSync is forced into a making a few actions which seem a little idiosyncratic at first sight but are actually sensible and others are work-rounds for shortfalls and bugs in the Google APIs (Application Programming Interfaces). It is worth reading http://www.pirules.org/blog/ which is far more than a blog as it has the various bits of information that help one work out why some things have been done the way they have. You will notice that once gContactSync is install the contact editor has a lot of more tabs as gContactSync (and MoreFunctionsForAddressBook if you use it) both add their own extra tabs. You will also note that address book items without an email have often have a dummy address added - without this a contact without a email address will not synchronise - the program description implies they have this dummy email address added by gContactSync to get round a Thunderbird problem with address lists items without email addresses causing a freeze/crash. One outstanding anomaly if you are set up to synchronise all groups and Contacts is that one synchronises with a new contact (or one that has been copied into the address book) it does not end up in 'My Contacts' in gmail contacts but in 'Other Contacts' which does not transfer to the Blackberry and likewise deleted contacts are also transferred to 'other contacts' from Thunderbird - I find that for my appliation editing is best done on my Blackberry. This seems to be a known feature rather than a bug but it would be nice to have an option available. You may wish to follow the same route as I did to test gContactSync and the various workrounds I will come to latter. What I did was to set up an extra two address books so I could test using synchronisation between these two contact lists rather than use separate machines. I used a 'spare' gmail account I set up earlier for this purpose. This technique worked very well. I started off by creating the two address books then added the two new accounts to them. I turned off all the fancy things with phone numbers in the preferences windows so I kept as close to Thunderbird as possible. You need to have Address Synchronisation turned on (this is off by default on version 3.5 but should on in 0.4.0) as there were and still are various differences in the way Thunderbird and Google store addresses. Thunderbird stores what are know as structured addresses, which are the individual components of an address (street, city, state, zip code, country, etc.) while Gmail originally only stored a formatted address which contained the entire address in a single field. Google now automatically converts addresses between these two formats hence version 0.4 has it on by default. The basic test was to create a new Contact and make sure it is transferred between address books and then fill in all the standard and extra fields and see that they were all transferred correctly - that is not always the whole story as the changes also have to be detected so the test really needs to be done field by field. Many of the fields are common between Google Contacts and Thunderbird addresses but some are not consistent and more likely to give problems. These include Phone numbers and fields that make up an Address. There are also a set of extended fields in Thunderbird some of which can only been seen and changed by Extensions such as MoreFunctionsForAddressBook and some are added by gContactSync and these also needed to be investigated. Lightening 1.9 Adds Calendar and Task functionality. MoreFunctionsForAddressBook 0.6.8.1 A very important extension which makes the Thunderbird Address book much more useful. It gives greatly extended searching and choice of columns to display as well as more powerful import and export. It allows viewing of some existing hidden fields as well as adding some additional fields. It is a potential source of interactions and the fields it reveals and the extra fields it adds needed particular investigation when used with gContactSync. SyncKolab 3.0.1 Synchronises my Personal Address Book, local Calendar and Tasks between all my machines running Thunderbird via an IMAP server. Should not have interactions with the other address books as configured as it set only synchronise my Personal Address Book. Provider for Google Calendar 0.18 integrates Google calendars into Lightning alongside other local and web calendars and provides bidirectional access whilst online. 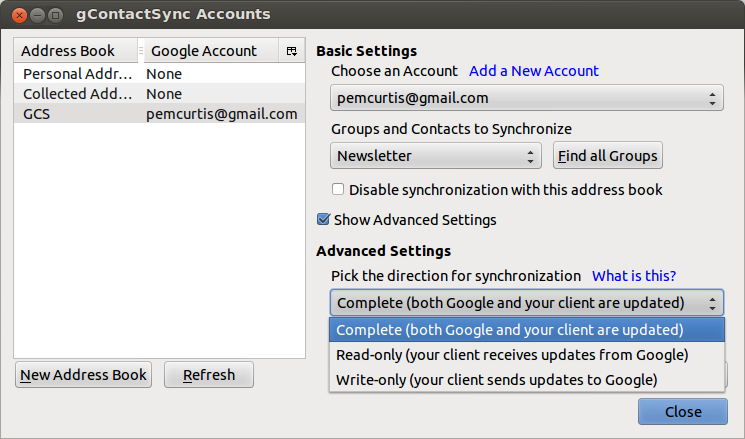 Should not interact with gContactSync as configured which does not synchronise Calendars at present. gContactSync 0.4.0b2 was the latest version of extension at the time of the tests and used to add synchronisation of my Blackberry via Google Sync and Google Calendar to a separate Address book ie no multiple synchronisation with SyncKolab with risks of multiple entries. Address Line 2 is a real problem - it is not synchronised as it does not exist in Gmail Contacts but it can still shows a conflict if it is changed and updating of everything on that card can be blocked. A quick and dirty workaround is to force synchronisation in the case of a conflict to be from the server to local which at least allows other changes to be propagated even if the second address field does not sync or see below for better solution. This is a bug in my book. Summary of supported fields and synchronisation results using gContactSync (and SyncKolab) TB to TB via Google and Blackberry to Thunderbird via Google using Google or BIS Sync on the Blackberry. The initial table has been extended to include a comparison of gContactSync (SyncG') with SyncKolab (SyncK' ) which I also use and similar results from BIS Sync for Blackberry to investigate the wider integration of address books. y = supported or sync works . N or n = Not Supported or sync fails. h = hidden field. C = Column can be displayed. S = Cards can be searched for this field. Some shortfalls and need and consequences of Workrounds in the various programs are highlighted. Solving the Second Line of Home and Work Addresses problem and Synchronising the Categories field. The address field problems occur because the fields used by Thunderbird and by Google Contacts do not match. Google does now support 'fixed' fields like Thunderbird for all Addresses but one field (the second Thunderbird address line has no equivalent). Google Contacts instead has a first address field which supports multiple lines. This gives a problem as the second address field tends to get lost during transfers between machines running TB or during a reset which reloads everything from the Google Server. 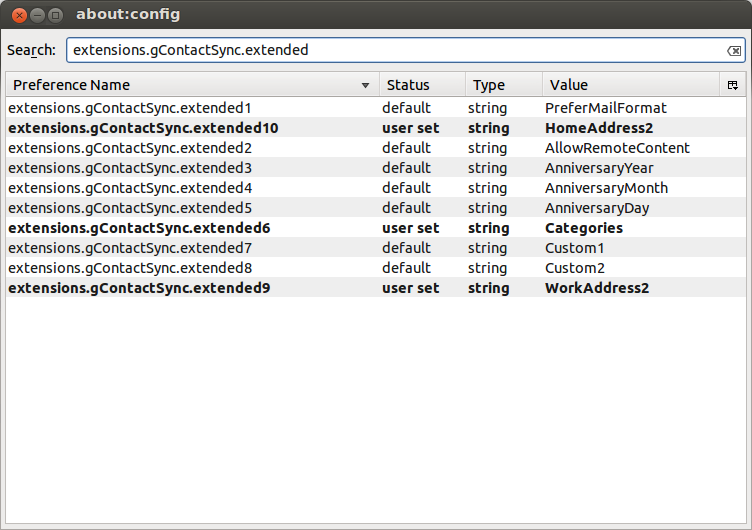 gContactSync however has a facility to synchronise 10 extra fields which do not exist in Google Contacts but are fields that gContactSync should sync with other Thunderbird clients. These fields are not visible in Gmail; only gContactSync sees these fields and knows what to do with them. The names must be valid fields in Thunderbird. It's main purpose is for users who synchronize a single Gmail account across several computers (such as businesses who synchronize business contacts to their employees' PCs). There are currently are ten of these extension/extended fields which are preset to useful functions such as 'preferred email format' and the 4 Custom fields. In version 3 they were on a tab which has been removed in version 0.4. The feature is still there but it requires editing preferences in the Thunderbird Config Editor to change the fields that are synchronized. Edit -> Preferences -> Advanced -> General tab and click Configuration Editor, read warning and ignore, then continue and Search for extensions.gcontactsync.extended and right click -> modify and change the extended6 value to Categories - this replaces something I have never heard of called PopularityIndex. This has to be done on every copy of Thunderbird you are using (in fact within every profile if you have multiple profiles) before you do any serious synchronisation to avoid loss of information from the second line of Addresses or the Categories. This change allows the second address fields to be synchronised between Thunderbird address books but not in a way accessible to Google Contacts and at the additional expense of loss of synchronisation of Custom 3 and Custom 4 - I do not use them but that might be a problem to others. I have put a posting in the conference suggesting more such fields are made available. 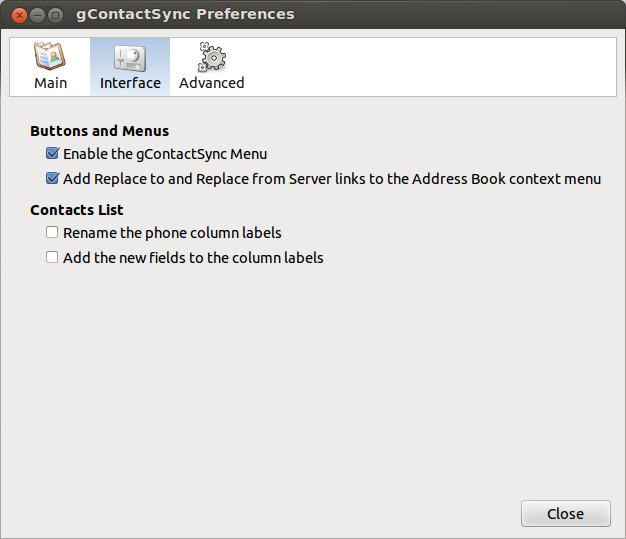 Summary of Configuration changes made to gContactSync in Preferences. I have rather skipped over how to set up gContactSync Accounts which is where the form of likage between Gmail Contacts and Thunderbird Addressbooks is defined. I will now do so in some detail as I initially did not undersatnd exactly what the various settings implied and the help and howto information is sparse. Firstly one must remember that a Gmail Contact Group can be Synchronised to either a single addressbook or to a TB List within an Address book. A good default is to avoid all use of Thunderbird Lists which are flaky to say the least and to Synchronise only with the 'master' Group 'My Contacts' where all your normal contacts should reside. This is exactly the synchronisation set up used by most PDAs and Smart Phones when they synchronise with Gmail Contacts. This is certainly what I have found best and trouble free for me when synchronising my Blackberry to Thunderbird and Thunderbird to Thunderbird between up to 7 machines. This is also the default already provided if you touch nothing under Groups and Contacts to Synchronise as the dropdown is already set to My Contacts and you do not need to click Find all Groups for this setting. Just use the New Address Book button to create a new address book with a name such as GCS shown in the example below and the click Add a New Account link to get to a window where you can enter your Gmail Account and Password details. At the end it will look like this for the GCS address book which is highlighted although not very clearly. One does not have to synchronise to My Contacts - you might have a Google Group called Newsletters which you want to Synchronise to an address book. Now is the time to Click the Find all Groups button and you will see below that the extra Group called Newsletters is in the drop down list and has been selected instead. Click save changes and you are set up. In the case of Synchronising with Newsgroups you might want to make sure that it is never updated by accident from some machines. Check the Show Advanced Settinngs box to give access to another dropdown menu where you can pick the direction for synchronisation. The last configuration I will discuss is also the most flexible where All groups and contacts are synchronised. In this case each Google Contact Group is synchronised to a matching Thunderbrd List. I used it for a period but I did not need the flexibility and have never used Thunderbird Lists very much as I have never found them consistent regardless of their use with gContactSync. If you already use Thunderbird Lists successfully or already have a lot of Google Contact Groups you should try this but make backups. Lists Items have to have an email address and gContactSync will add a dumm one when required which is visible in Thunderbird but should not be transferred to Google Contacts. 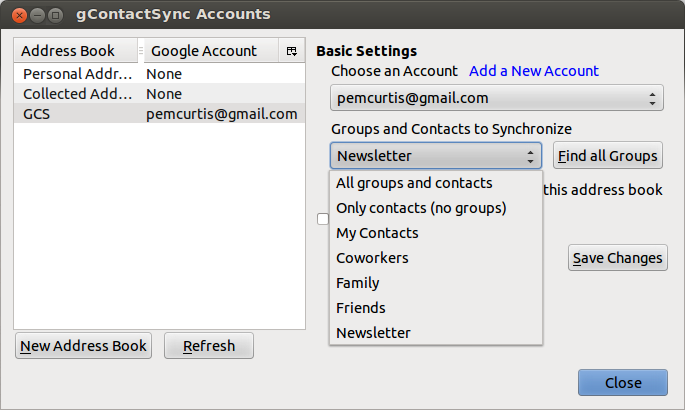 gContactSync will create Lists for My Contacts, Friends, Family, Coworkers and any Groups you have created in Google Contacts and vice versa automatically for your Thunderbird Lists. Some contacts without an email address have had a [No Email address found] string added to the first email field which prevent gContactSync from working as it can not add its random dummy email address to the field which is required to make TB lists work reliably. The original address book has a large number of invalid Birthdays and Anniversaries. The fields seem to need either a sensible date or be blank otherwise it causes errors in the Google APIs (Birthdays) or in gContactSync (Anniversaries) which show in the various error logs and prevent transfers to the server. Cards with duplicate email addresses anywhere elsewhere in the address book are not synchronised or transferred. Export the address book to a .csv file - [I think this is MFFAB function??? Check!] and one must note that it exports far more fields than can be read back by the csv Import built into TB so data beyond the minimum TB set of fields will be lost. Clear the contents of the three columns for the Birthdays (the zeros seem to cause the problem) as I only had a couple of Birthdays set up. I also sorted on the email field and cleared all the email fields which had a message like [No email address]. Save to a new name. Copy blocks of a few hundred at a time from the New Address Book and Synchronise checking no problems after each block. I did it in small blocks because I had a problem with exceeding a daily data limit from Google at one time when creating new entries. Go online to Google Contacts and select All and ADD to My Contacts otherwise they will not synchronise with the Blackberry. This seems to leave me with clean data which has the same number of entries on the server and the error log was clear. I also found I have a number of comment fields which had characters which gave errors when importing which also had to be sorted in as much as a number of my notes fields had characters that could not be read and the fields had been replaced by an err:501 or err:509 - fortunately they all seemed to have come from even older inward transfers from H95 and HP200 PDAs and those that had not been tidied up could be mostly be junked. I found that the new cards uploaded fine but that they still had to be added online to My Contacts and then a reset before everything was completely sorted and the dummy address were present on all cards. Another strange anomoly was that even after all my cleaning up I found I was short of about 10 cards in the My Contacts list even after a reset. I finally found them and they all had duplicate email addresses elsewhere in the address book - when these were removed everything was set up. It is known that Thunderbird has severe problems with Lists and, in particular, Drag and Drop into them which have been going on for over ten years judging from some bug reports. What is worse the problems seem to be dependent on any changes in version so one week you may think something is working and the next it has again reverted. There are some further quirks when one is synchronising using the 'All Groups and Contacts' setting in getting cards into the My Contacts Group which is essential if you are also synchronising a PDA/Smart Phone. Once they are in the Groups and Lists updates to cards seem to be fine. What happens is that when one creates a new card or drags one across from another address book and synchronises the card only appears in Google in the other 'group' which I think is to be expected. If one also drags it into the My Contacts list in TB before the first synchronisation it still only ends up in 'other'. If however one does a synchronisation as soon as you have created a new card or draged one across from another address book ie before adding to any lists and then drags the contact into My Contacts list in TB it correctly transfers to My Contacts in Google on the next synchronisation. Trying to get round an initial mistake and not synchronising at the correct time by deleting the card from the local list, syncing then try to add it back does not work and it does not show in the list until after a restart of TB - there must be a shadow of the old entry in the list until Thunderbird is restarted. This requirement on timing of the synchronisations and problems with deleted entries is not a logical behavior and seems to be a bug but it is not clear if it is with Thunderbird, gContactSync or even the Gmail Contacts API. I have seen somewhere that there is an automatic compaction of Thunderbird address books and lists (at shutdown or computer restart??) which does not always reset all the pointers correctly especially after an error has occured and that in the limit one sometimes has to delete all the contents (or create a new address book) and download again from the Gmail Contacts (ie use the reset function) or reload from a backup (But does a copy of the .mab file still hold the errors??). I do not like this unpredictable behaviour. At present I am using accounts set up to just synchronise the Google My Contacts Group and I do not have any Contact Lists on the Address book it is synchronised to. I also have an account for All Groups and Contacts with a different address book on one of my machines to continue testing. It may not be a good long term solution to be duplicating every Synchronisation on a machine but it does make testing very easy and gives an element of backup against one-off failures. gContactSync works surprisingly well once one has done the one off setup and has a clean address book - almost all my problems were not caused by gContactSync itself but by the data fields in my original address books - it is possible that better error checking and handling could be included. I have been using it full time for 8 months between several Linux machines and my Blackberry without any problems. I continued to use SyncKolab in Parallel during this period to synchronises my calendars and tasks and to provide an independent address book. If I did not have an IMAP mailbox available to support SyncKolab I would now be very happy to solely use gContactSync for Thunderbird Contacts and the 'Provider for Gmail Calendar' add-in for Calendars. Yes there are a few quirks and some need for configuration to preserve and access some fields and to make new entries easily but that is a small price for what has been a very robust piece of software. I do however find it worrying that the only pieces of software I know of to carry out this very important task are written and supported by single developers working in their own time whilst Google is withdrawing the support it provided from its competitors such as Blackberry. We all owe a great vote of thanks to such people as Josh Geenen. If you need both read and write access to a Google Calendar from Thunderbird/Lightning the best way is to install the Provider for Google Calendar from addons.mozilla.org. This gives a very simple way to get an extra calendar in Lightening/Thunderbird which is synchronised with the Google Calendar and hence your Blackberry if you are using BIS with a Gmail account with synchronisation enabled. There may be some anamolies if you have very fancy repeats or alarms but all normal calendar items and functions are fine. Get the extension from https://addons.mozilla.org/en-US/thunderbird/addon/provider-for-google-calendar/ - Download the file by right-clicking on the link and choose Save-as. 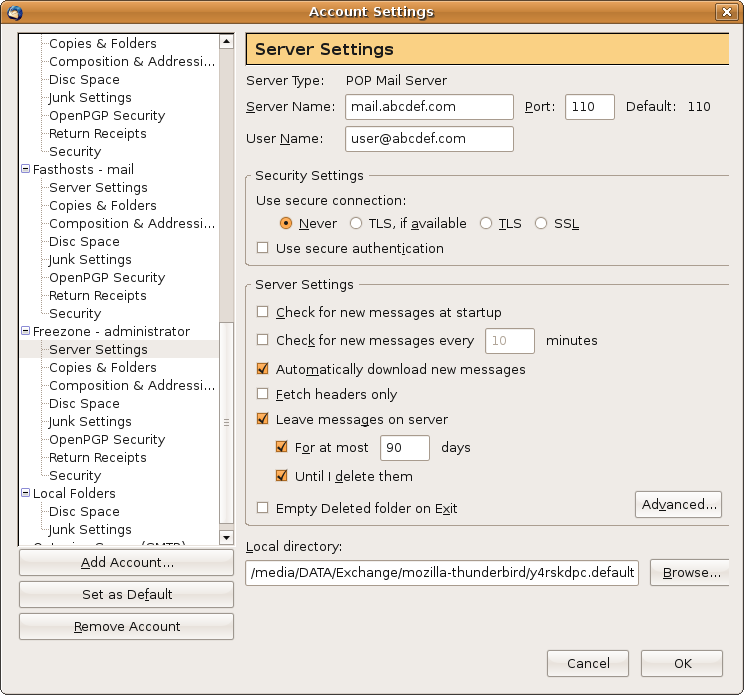 Then in Thunderbird with Lightning installed, choose Extras/Tools > Addons and click on the install button. Point it to the downloaded file and install the extension. To access your calendar data, you need to retrieve your private XML URL from the Google Calendar UI. 2. Click "Settings - Calendars"
4. Click on the private XML button and copy the link that is shown. After installing the 'Provider for Google Calendars' extension you can create a new calendar by File -> New -> Calendar and choose "On the network". Then pick "Google Calendar" and paste or enter the URL to your calendar and check the cache box. Click "next" and choose a name and color. Click "next" and a popup appears in which you have to enter your login (with or without the @gmail.com part) and password and choose whether you want Lightning/Sunbird to save your password. Choosing "next" creates the calendar and provides you with two-way access to the google-calendar. There will be a new toolbar item in Calendar view called Synchronise which synchronises your Google Calendars on demand as well as when you start and at 30 minute intervals. I have been looking for a way to handle SMS messages under Ubuntu, in particular when using my USB Dongles which are designed for Mobile Broadband but use SMS messages to purchase additional time or packages, check usage and other housekeeping associated with their use. In general I have been using Vodafone in the UK and NZ for Broadband with a variety of SIMs and tariffs. Vodafone provide a comprehensive 'dashboard' under Windows which I have had to access on a dual booted machine occasionally or to do my 'accounting' via the web. I want to avoid having to use Windoz as we are moving to pure Ubuntu machines without dual boot. One solution is to use the very complex to implement Vodafone Dashboard for Linux I covered in the Page on Mobile Communications. The main tools I initially found available within the Ubuntu distributions are based round the package gnokii. The useful interfaces are Xgnokii which is a GUI front end to gnokii and gnome-phone-manager which is an even simpler applet which sits in the tool tray and alerts you to incoming SMS messages and allows you to reply or write new ones. Many of the USB Mobile Broadband Dongles have several Serial USB Ports so that they can provide information on, for example, signal strength whilst connected via an alternative port. Although you can install knokii using the Synaptic Package Manager you still need to copy a configuration file /etc/knokiird into your home directory, rename to .knokiirc and configure for your connection (path to the port used for SMS, often /dev/ttyUSB1 ) and model to AT (AT command set interface) at a minimum. You can at re- configure the gnome-phone-manager within the package but you do still need knokii to be set up first and it is desirable to do some checks using gnokii before using anything more sophisticated. In trying to get to grips with what was going on I found a very full explanation and tutorial which provides many of the basic AT codes and demonstrations of how you can use them to test the facilities of a GSM phone or dongle to send and receive SMS messages at the Developers Home SMS Tutorial. It is very comprehensive and runs to 66 pages, it gave me a much improved understanding and enabled me to receive and look at an incoming series of TXT messages quite easily. Example - ZTE manufactured Vodafone K3565-Z USB mobile broadband stick. I found using these that there seem to be two responsive serial USB ports for the ZTE modem which are /dev/ttyUSB1 and /dev/ttyUSB3. I have found the SMS facilities can be run in parallel with a Mobile Broadband connection by using port /dev/ttyUSB1 for the SMSs and /dev/ttyUSB3 for the broadband connection. The ZTE manufactured K3565-Z uses /dev/ttyUSB3 for the internet connection. I have been able to send and receive txts using /dev/ttyUSB1 on the ZTE stick and also on the original Huawei Vodafone Z3565 which uses /dev/ttyUSB0 for Internet. Which deletes message a message gnokii -deletesms stored in SIM (SM) location 4 . The gnome-phone-manager applet is basic but easily installed by the Synaptic Package Manager. This allows one to send and receive SMS messages from a GUI interface accessed via an Applet which resides in the tool tray once it has been run from Applications. This is enough to enable me to interrogate the NZ phone balance by BAL to 777 and MYADDONS to 756 as well as various purchase of bundles and top-ups. The SMS messages seem to only be displayed when the applet is running (and you have a signal) but this is fine for quick interrogations of the balances and any other interactions where you expect a near instantaneous response. It means that one can do almost everything without a Vodafone Dashboard and Windows or use of the internet. A better SMS package is still needed for checking for 'old' SMS messages and cleaning up. I tried Xgnokii which works to some extent but the display is odd and it does not access everything. This led me to try the Wammu telephone manager. I finally found a package which does what it is advertised to do as far as sending and receiving SMS messages and claims to work with all AT command compatible phones including USB Mobile Broadband Dongles. Wammu is a GUI front end to Gammu which had its early origins in knokii. It can be installed by the Synaptic Package Manager and there is also a Launchpad PPA available so you can get the latest versions and have them automatically updated - I used the straight version from Jaunty for these tests. Use Retrieve -> Messages to access all the SMS messages that are still on the phone - it retrieves both those in the phone or the SIM memories. If you right click a message you have options including delete. You can set an option to automatically connect to a phone when you run the program (Wammu -> Settings -> Gammu tab and tick box) but not to Retrieve Info or Messages. So far everything I have used has worked and it does everything I need to handle SMS messages on my Mobile Broadband USB sticks and it should be able to do much more via a Bluetooth to my phones as it also handles contacts and calendars. I have not tried it with Windows Mobile but do not expect that to work as Microshaft rarely implement any common standards as one would expect. and then doing an update using System-> Administration -> Update Manager which finds the latest versions and updates everything. It now works fine again and I assume that the latest versions (Gammu version 1.27.1-1) will eventually find their way into the Ubuntu repositories but until then I recommend using the PPA and have added it to my standard installation script. Wammu in Natty: This is Wammu version .35 and gammu 1.28 so a PPA is not required. All the fixes for the Systray, Bluetooth Startup and rfcomm creation are required as one would expect if you are using Bluetooth. Otherwise there seem to be no changes. Shortfalls in Wammu: Wammu does not have a mode that I have found to automatically monitor for the arrival of new SMS messages and you need to run the gnome-phone-manager to do that. It does not automatically download messages, contacts etc when you start it so you always need to retrieve them manually. The lack of monitoring for new messages is a nuisance as you need to run the gnome-phone-manager if you expect messages then change to Wammu for anything more sophisticated. The manual downloading is not a problem once you realise but it would be better to download the first time when you start up. Signal strength monitoring seems to be odd and works on some USB sticks and not others so the ability to set up the AT string to check in settings would be an advantage. Overall it is a very good tool with a few irritations which I hope are fixed in future versions. I would be very pleased if visitors could spare a little time to give me some feedback - it is the only way I know who has visited, if it is useful and how I should develop it's content and the techniques used. I would be delighted if you could send comments or just let me know you have visited by sending a quick Message to me.